Solar hot water can reduce a home’s energy consumption by as much as 50%. Many people don’t realize the energy required just for domestic hot water. In addition to domestic hot water, solar can heat a home, pool or hot tub. Solar heating beautifully supplements hydronic heating systems, such as radiant floors, radiant baseboards and panels. Hot water and space heating together account for close to half of an average home energy consumption. Solar hot water replaces that energy consumption with clean, free energy from the sun. A huge percent of our national energy consumption comes from our homes. Solar hot water can and will make enormous progress toward a cleaner world and toward preserving natural resources. Country Wide Plumbing , supplies and installs both evacuated tubs and flat panel solar systems. 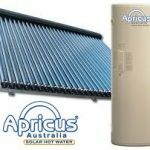 We have practical experience with most brands of solar system, and are approved service agents for Apriucs Solar systems. Our preferred brands for Evacuated tub systems, is Apricus, and for Flat panned systems: Edwards. Evacuated solar system has the hot water cylinder on the ground and a pump circulates the water through the manifold on the roof were the water is heated by the evacuated tubs , the round tube passively tracks the sun throughout the day giving the highest possible performance from early morning through to late afternoon. An Increase pitch frame can be installed to maximise the efficiency of the solar system. The flat panel solar system has both the panels and cylinder on the roof, there is a choice of colours for the tank to match the roof colour. The flat panel solar system circulates water from the panels to the cylinder by process called thermal cycle and does not require a pump.